After six days in Hawai’i, I had attended my cousin’s beautiful beach wedding, I had tasted the holy grail of desserts – macadamia nut cream pie, I had eaten poke and ordered loco moco, and I had bumped along an unpaved road to reach the place where Hawaiians believe the spirits of their dead depart for the next world. After accomplishing all that, it was time to begin the journey back home. While the trip was quite similar to the one into Hawai’i, I though I would share some more pictures of the trip for those of you who enjoy them. Check out the video of our takeoff from Honolulu – the reef just off the runway is gorgeous. The check-in area of Honolulu International Airport reminds me a bit of LAX. In fact, it looks more “LA” than LA does. The interior, though, is still in that 1970s time warp that seems to be pervasive in Honolulu. 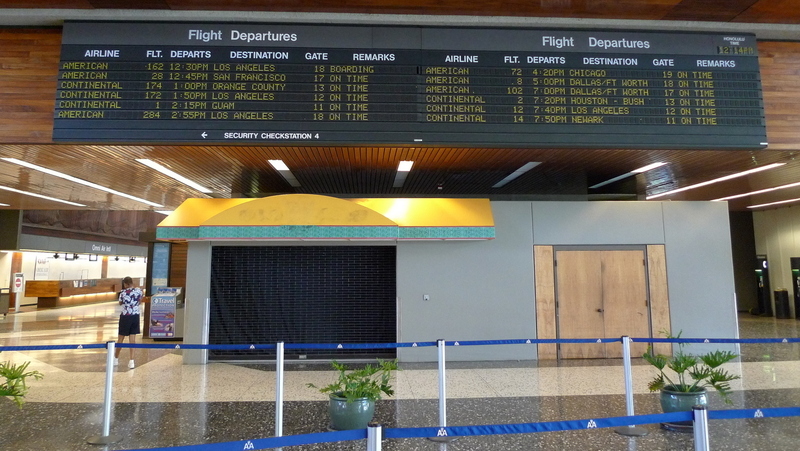 It seems that an expansion and remodel is planned so we’ll see if that brings the airport into the 21st century. Oddly, this video monitor shows the date as November 30. Only off by a few months. 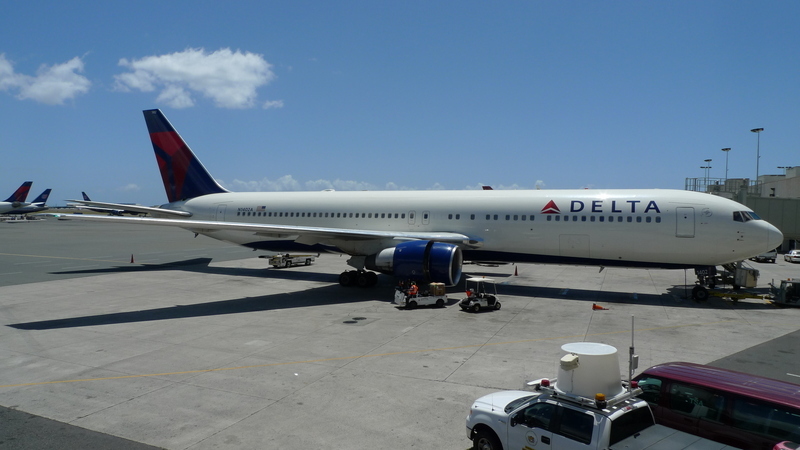 A Delta Boeing 767-300 heading to Los Angeles. Two Continental jets. The nearer one is a Boeing 737-700 headed to John Wayne International in Santa Ana, CA. 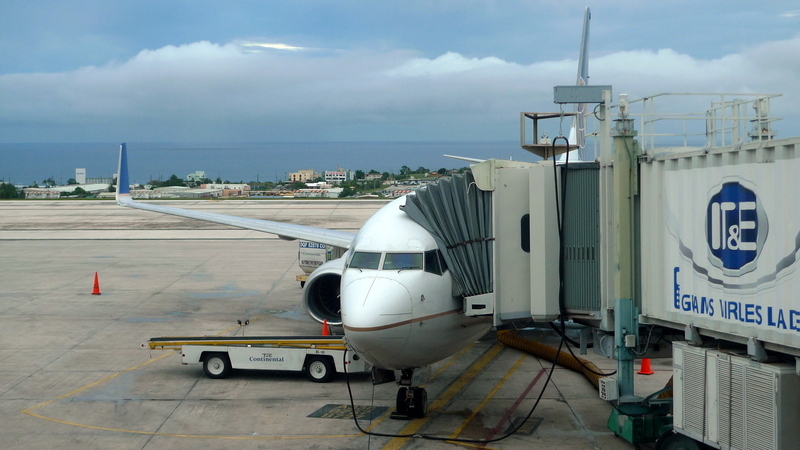 The further one is a Boeing 737-800 in the new United livery, headed to Los Angeles. 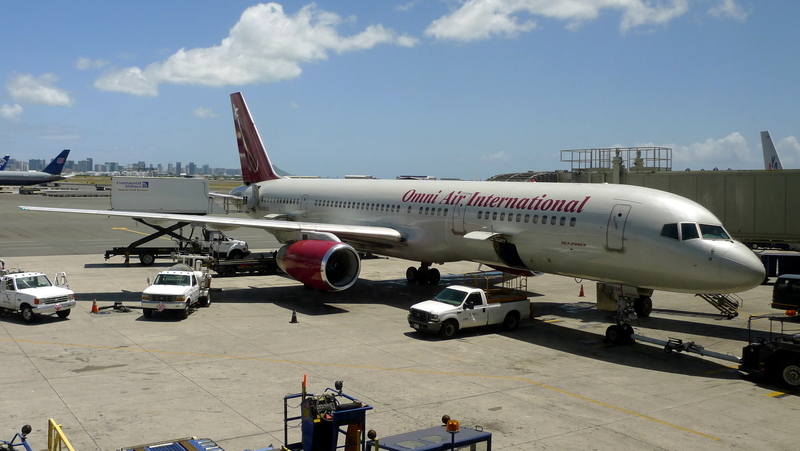 This Boeing 757-200ER belongs to Omni Air International, a charter operation based in Tulsa, OK.
Alaska Airlines also flies to Honolulu. This flight is going to Portland, OR. 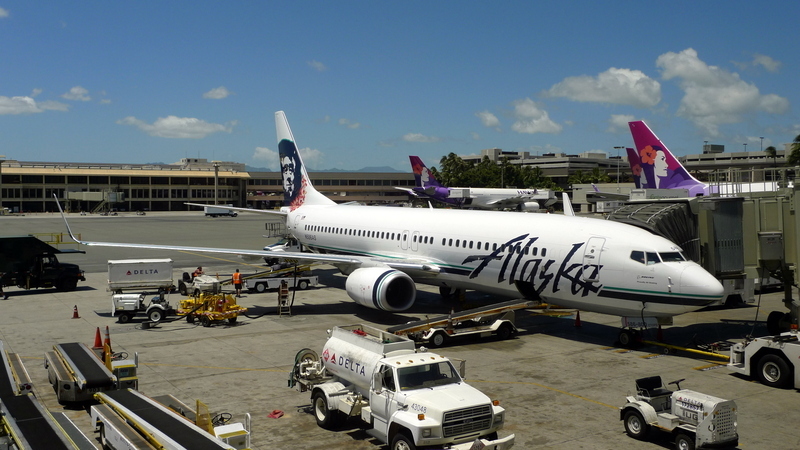 This Boeing 737-800 is part of their Hawaiian subfleet – notice the lei of flowers around the Eskimo’s neck. 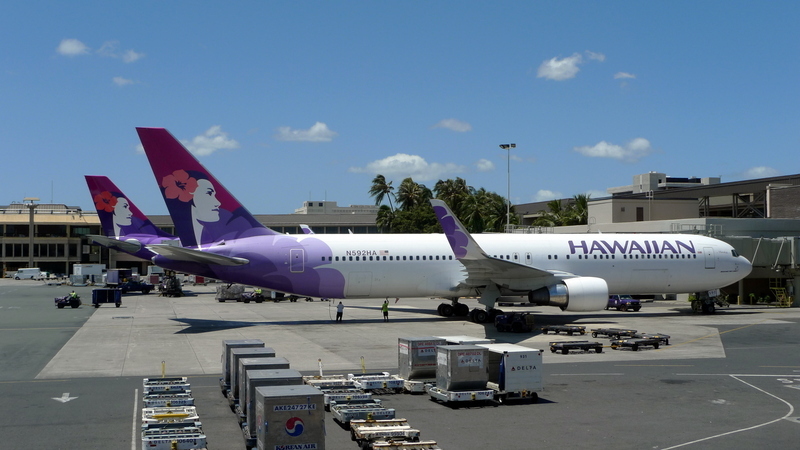 Hawaiian Boeing 767-300 with winglets. These winglets help reduce drag, resulting in an improved fuel economy of about 3-4%. 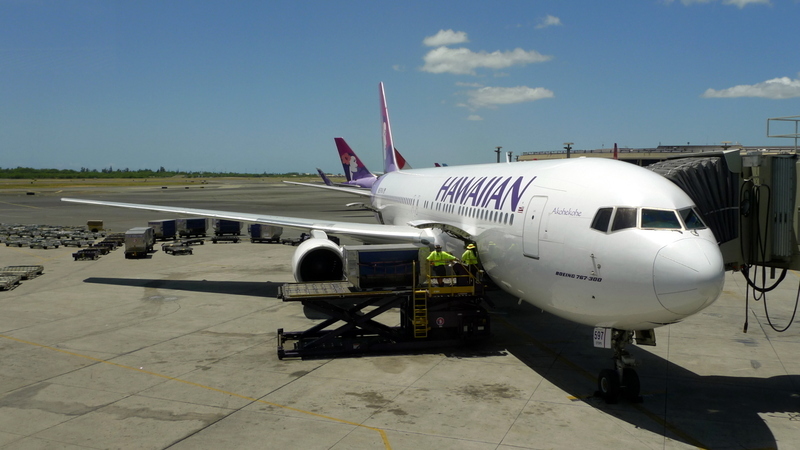 One of Hawaiian’s new Airbus A330s is in the background. 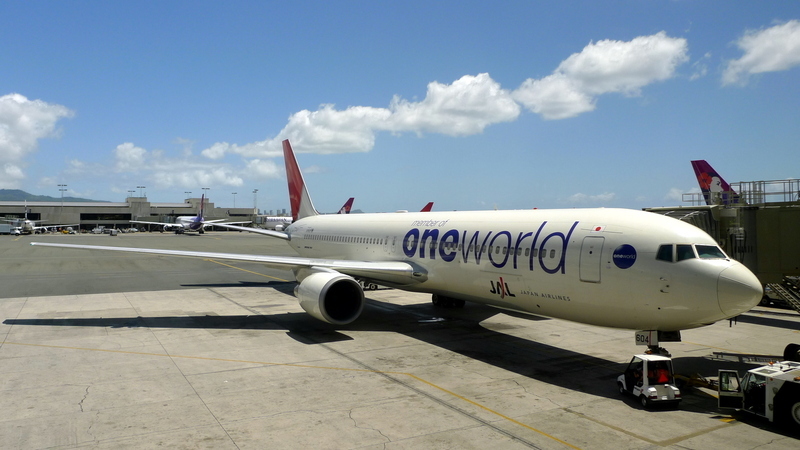 Japan Airlines Boeing 767-300 in “Oneworld” alliance colors. This plane is bound for Osaka. 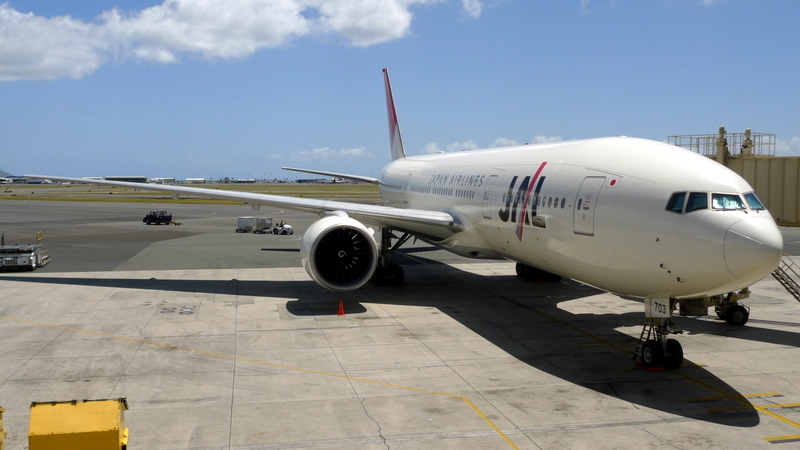 Another Japan Airlines plane, this one a Boeing 777-200, destined for Tokyo. The other major Japanese carrier, ANA (All Nippon Airways), Boeing 767-300. 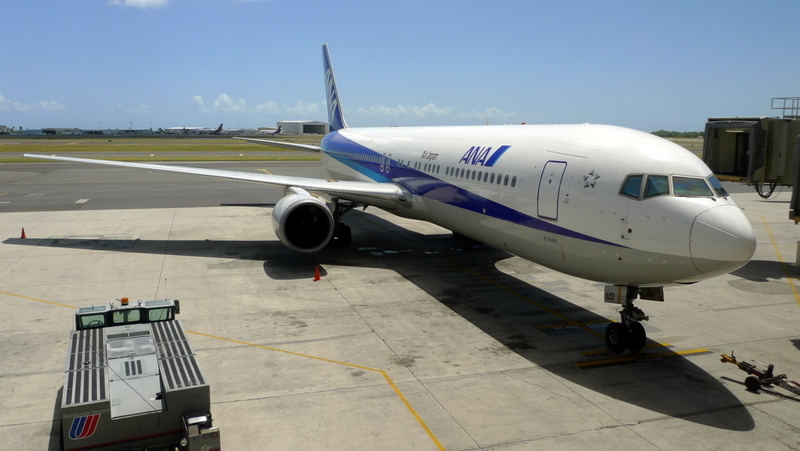 This is operated by ANA subsidiary Air Japan, which operates charter flights to popular vacation destinations. 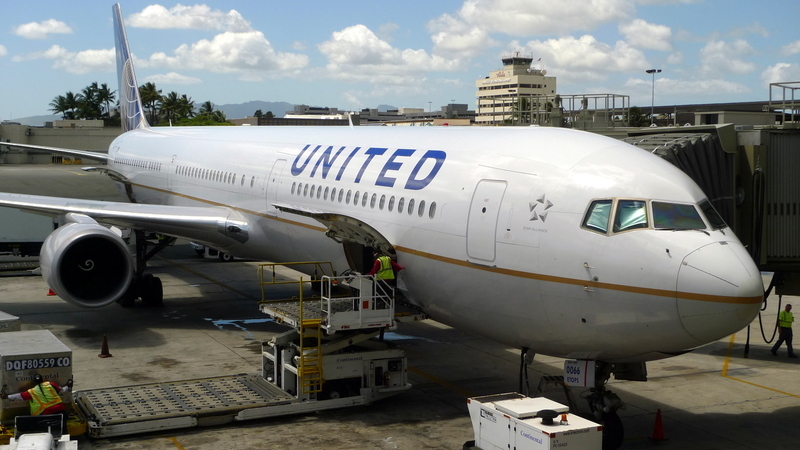 A United Airlines B777-200 scheduled for Chicago O’Hare. A Hawaiian Airlines Boeing 717 departs for another island in the background. 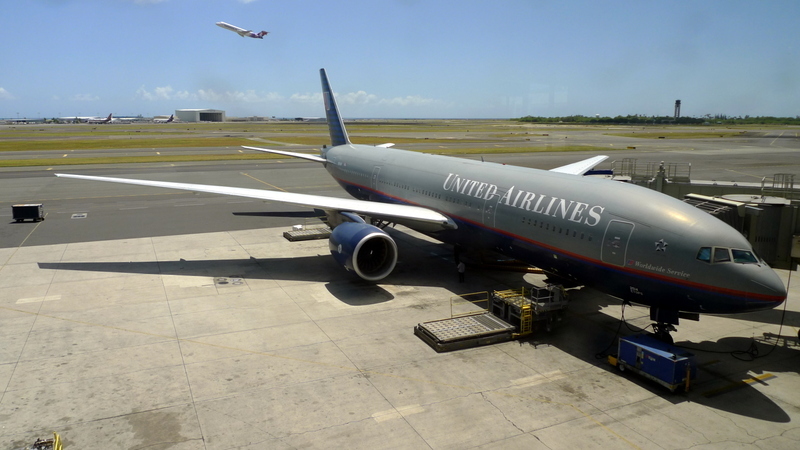 Our ride to Guam: A Continental (but in the new United livery) Boeing 767-400. The gate area was particularly crowded. In fact, the flight was oversold and they were asking for volunteers but $300 in travel vouchers was incentive enough, since I’d have to use the vouchers on another Continental flight! 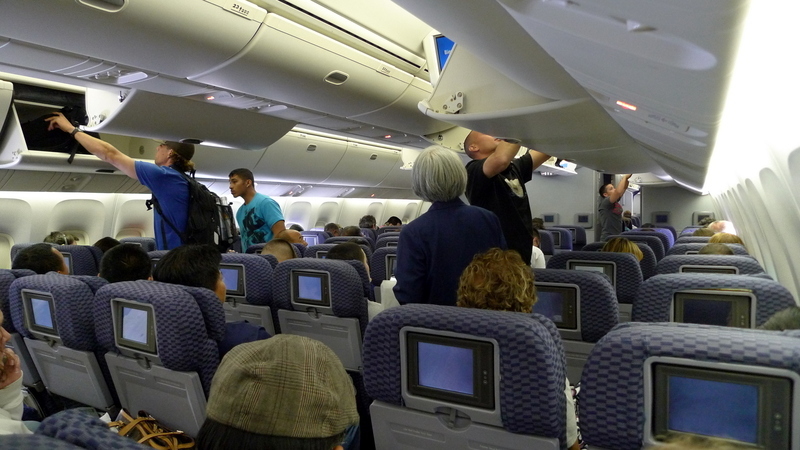 The interior of our plane during the boarding process. A video of our takeoff from the Reef Runway in Honolulu and landing in Guam. The lunch service was a choice between cheese tortellini and some chicken dish. I overheard the flight attendant tell another passenger that the pasta was the better of the two options, so that’s what I went with. It was actually pretty tasty, better than the food we had been served on the inbound flight. 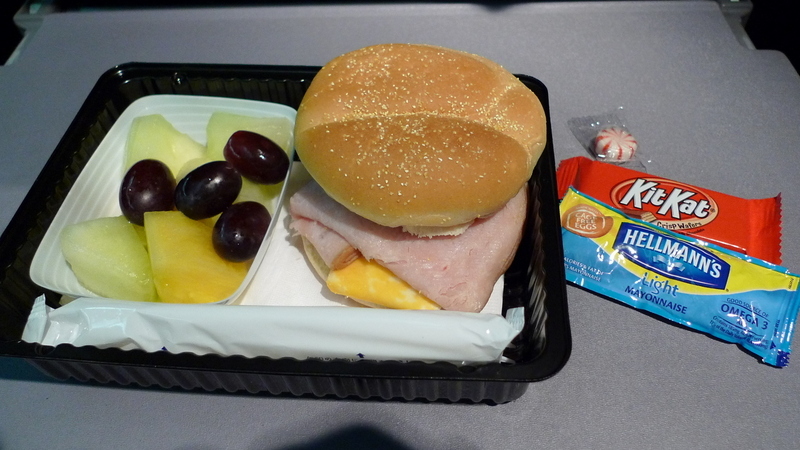 Mid-flight the flight attendants served ice cream – cups instead of sandwiches – and then about an hour before landing in Guam, they served these turkey ham sandwiches. 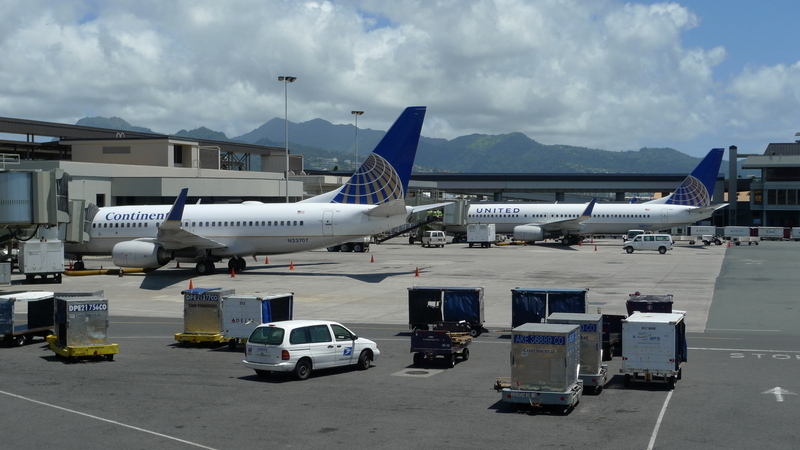 All in all, I think the flight from Honolulu to Guam and onto Hawaii was better than when we had traveled to Hawaii, probably because it was a daytime flight and we weren’t utterly exhausted. We didn’t have that much connection time in Guam. 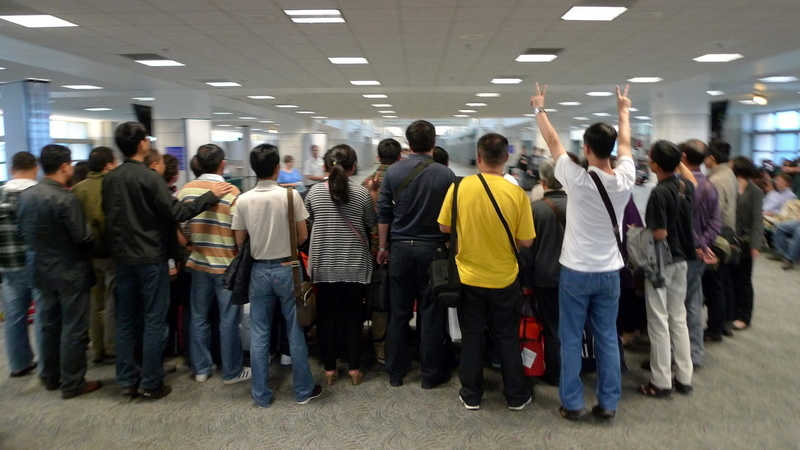 Here’s a picture of a Chinese tour group taking a picture moments before boarding. While they were seated further back in the plane and thus were to board earlier, we sneaked ahead and the gate agent, seeing the unruly crowd coming towards the boarding gate, let us board ahead of them. Our flight to Hong Kong, a Boeing 737-800. 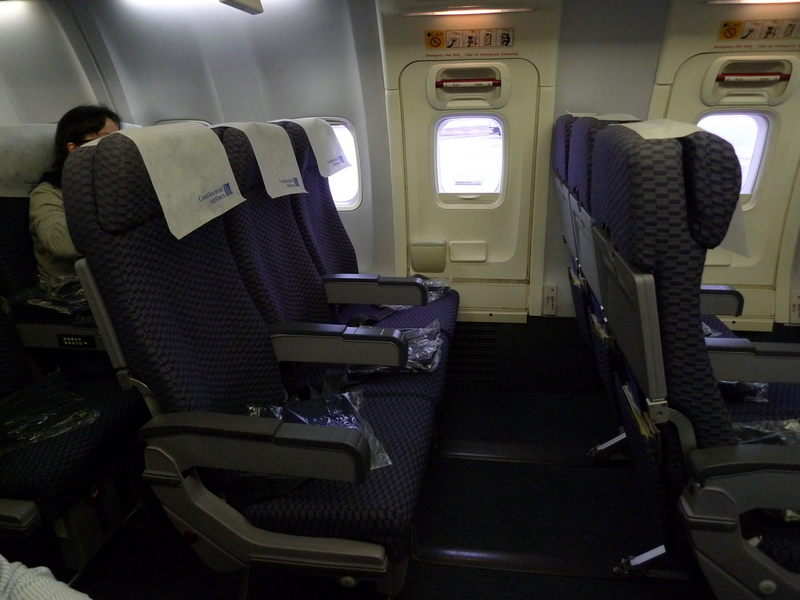 Once again, we had the option of buying extra leg room by sitting in the exit row. It was worth it and just like on the flight from Hong Kong to Guam, we had an empty middle seat between us. Interestingly, this flight was operated exactly a week after we had left Hong Kong and one of the flight attendants from the flight out of Hong Kong was working our flight back to Hong Kong. I don’t think he recognized us. Some thirteen hours after leaving Honolulu we arrived in Hong Kong, at about 8:00 pm. We headed into Ho Man Tin, a portion of Kowloon where friends of ours live. More about our two days in Hong Kong – and two Xangans we ran into – tomorrow. This entry was posted in Uncategorized and tagged airline, airplane, airport, aviation, Continental, Guam, hong kong, Honolulu, United by christao408. Bookmark the permalink. Nice! More planes to look at! Although the meals didn’t look as delicious as the ones in Kauai!Do you mean the L.A. airport is kind of 1970ish? Two Xangans you just ran into? Hmm! 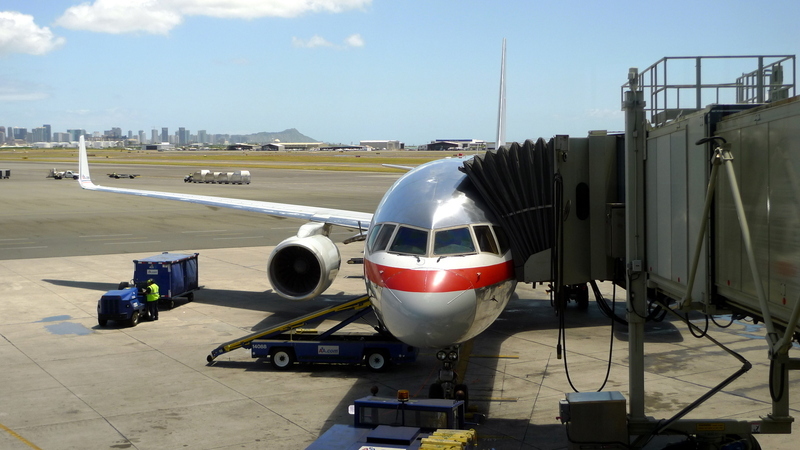 The HNL terminal was built while I was living in Hawaii — in the first half of the 70’s. I don’t remember the gardens, but the outdoors character of the terminal was one of its best features! And the reef runway was built just after I came back to the mainland in the mid 70’s. Glad it’s so pretty! Oh – nice reef runway! That’s so different. I actually don’t mind long waits at the airport if I can just watch planes take off and land. I think I have this fetish about airplanes and airports. I’m glad you got ahead of that tour group. 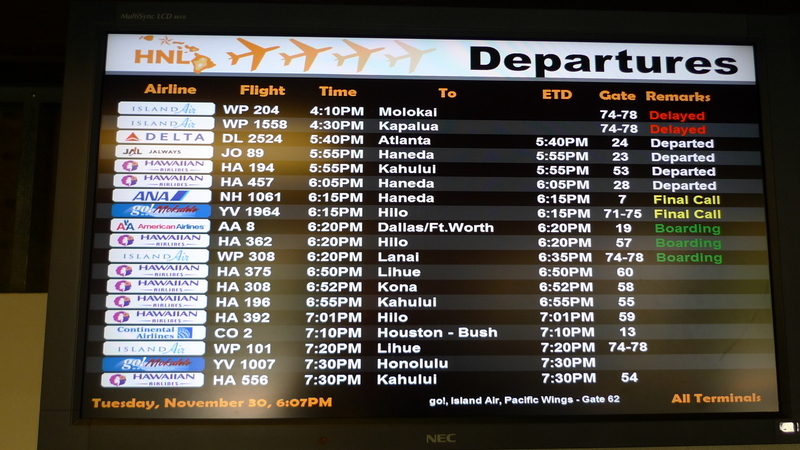 I love to travel and your trip brought back back memories of my flight to Hawaii and three weeks touring the islands. Welcome home! 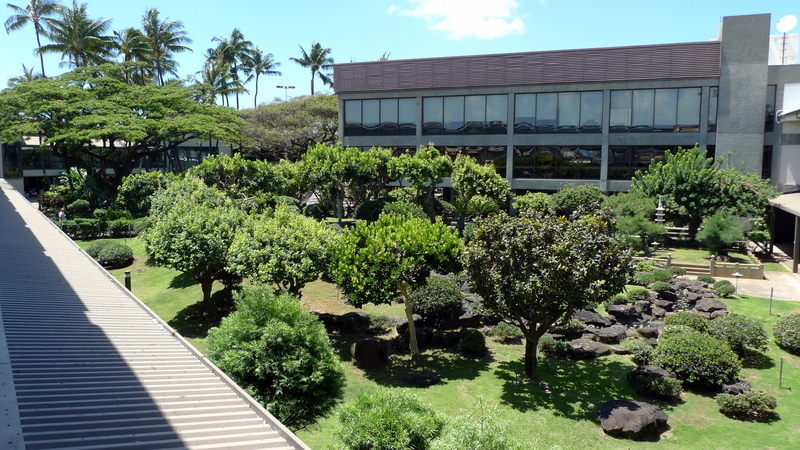 i like the honolulu airport… i think it’s dated feel has some charm to it, and helps the place feel more laid-back instead of like an urban, bustling airport. i never knew what purpose those winglets served; thanks for the info! i suspect most of the flights head to l.a. because it’s the closest major airport in the continental u.s., so it sort of acts as a default gateway to the rest of the country. i see you’re sitting on the right side of the plane again… missed another nice view of waikiki, although i suspect the plane turned before the people on the left of the plane really got good views of diamond head. @kunhuo42 – Yes, since we were heading southwest towards Guam, we made a quick right turn after takeoff and those on the left didn’t get much of a view. 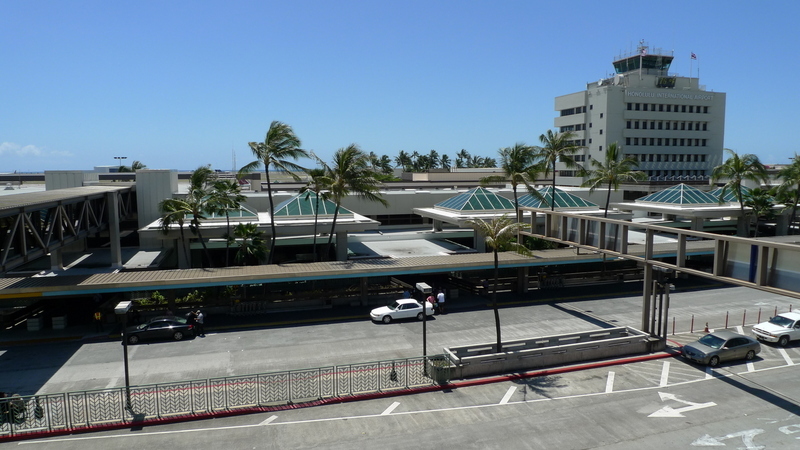 As for HNL’s dated look, it is charming and all in all I would give the airport high marks. After all, it has a pinkberry. LOL@Fatcat723 – Thanks, although the story doesn’t get to Bangkok yet. Still have two days in Hong Kong! =D@ElusiveWords – Watching airplanes is fascinating, both because they are very graceful designs as well as because there is an air of possibility surrounding them – you automatically feel like you are going places, seeing things, and are part of a larger world. @slmret – I didn’t know you used to live in Hawai’i. What brought you there? @Roadlesstaken – Well, one was unexpected, the other was planned. 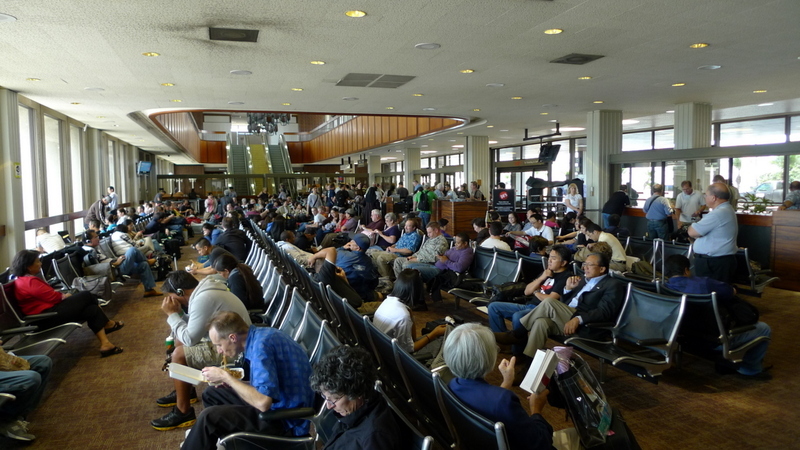 @CurryPuffy – LAX is very 70s despite the many attempts to remodel. I remember as a child traveling through there when each terminal was actually a satellite and you had to walk along the underground tunnel to get to the baggage claim. @christao408 – A lot of things — I’d been married and divorced, lived away from home (Santa Barbara) and back again, I was in a go-nowhere relationship, working at UCSB during the year when the Dean of Men was stoned and the kids burned the bank down when prompted by the Chicago 7, and I’d been to HI on vacation a couple of times and loved it. I needed to try my wings again. I was there from 3/70 till 11/74 — wonderful times! I LOVED the video of the take -off from Honolulu. How could the flight attendant not remember you both. DUH! I would recognize you even if I were blindfolded! ha ha. @kunhuo42 – Yeah, Pinkberry is kind of near the Central Concourse, but in the main part of the terminal, not out towards the pier. @ZSA_MD – Glad you enjoyed the video. The flight attendant was this grumpy gus and we didn’t have any interaction with him, so we didn’t get an opportunity to make an impression. @slmret – Wow, you need to supplement all your great photography with some of these stories. You could write a book! @kunhuo42 – Here’s the link. wow the pasta does look good. Good use of your new video camera. Ready to go again. 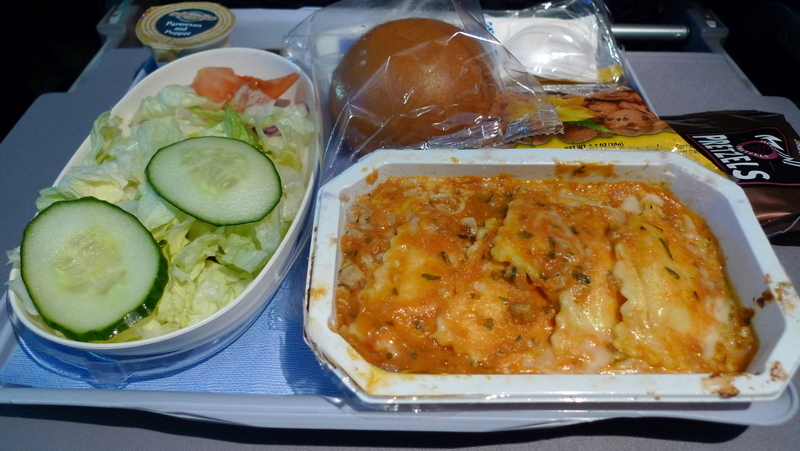 the take off and landing video is great!, usually the pasta dish in Economy class is quite good….. I miss Honolulu. How was Guam, did you see anything or just catch the next flight? That’s another port I was only in for the day at. @christao408 – o yeah that’s what I meant to say.